We have been devoted to "the background work" of sporting event or concert. Industry: Site management, visitor service, security service, facility service, imaging technology, international business. 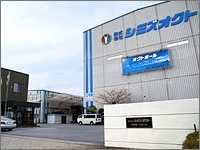 Shimizu Octo was founded in 1932. 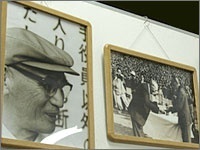 The founder, Mr. Hoichi Shimizu undertook the management of college baseball game such as ticket collector and event staff, and the creation of the information boards and signs. This was a precedent of the lettering. In the age when the computer did not exist, the letters on the sign board were drawn by hand. In a sence, they aleady had a model of undertaking the whole work of events such as site management and security. In 1946, as the professional baseball league started, their jobs were extended. After that, they became to be involed in several kinds of sports including swimming, rugby, track and field, and soccer. With the prosperity of the sporting world in Japan, they recieved orders which is related to the big stadium or arena like Tokyo Dome. Their job became more multifaceted with the time changes, and expanded the range of their services from sport-related jobs to convention, concert, and television. The site management, one of their main operations, is the creation and processing of scenic art, and TV studio set, or the planning of exhibition and the creation of display and signage. The primary events that they were involved in were "Madonna's concert in Japan (1987)", "Michael Jackson's concert (1987)", "Track and Field World Championships (1991)", "Nagano Olympics (1998)", and "Exposition of Global Harmony (2005)". It would not be an exaggeration that most of the big events in Japan are hosted by Shimizu Octo. 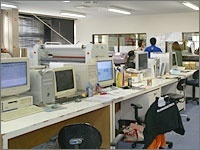 The core place where support their operation is Chiba studio built in 1990. Its site area is about 33057 square meter. The studio was built to respond to create the stage sets or display of the sporting events or concerts which are becoming larger scale every year. In the studio, the processings of woodworking, modeling, welding, and painting are done.Then, they also set a stage for the generalprobe (rehearsal). 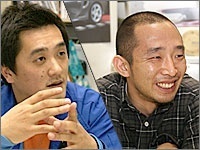 Shimizu Octo is the largest studio in Japan, both in name and reality. "The sign industry these days faces the demand of the more quick turnaround. The orders from the clients are really tight. It is not uncommon that we have only one day to get the orders out. To respond to the needs, it was imperative to introduce the small solvent inkjet printer which allows us for the flexible responce." said the group leader Mr. Toga who takes charge of planning, creation, and processingof the sign graphics. "The small inkjet printer" that they refers here is Mimaki's JV5. 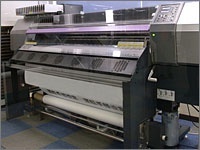 They already introduced a super wide-format inkjet printer (overseas product) with the maximum width of 5m. Mr.Toga uses JV5 for the name of the department, and this shows how JV5 contributes to their business. Compared to the super wide-format printer, JV5-160S, which print width is 1620mm, is relatively the small machine. What we can learn from this is how big their signage work is. Mr. Suzuki, who belongs to the production center, talks about the reason why they introduced JV5, and its advantage as follows. "The decisive factor of introducing JV5 was its productivity, which allows for the quick delivery. The high image quality is nothing special in this age. JV5 has a good balance between the print speed and the quality." Any printer can keep a certain level of the image quality when printing slowly. However, the current signage indusrty requires the prompt response, so the fast print speed is an essential element as well as the high image quality. Mr. Toga said "We already introduced JV3 and JV4 for more than ten in branch offices and other group companies in Japan. Compared to JV3 and JV4, the performance of JV5 was improved a lot. We feel that JV5 uses only a half of its performance compared to the full operation of JV3 and JV4." 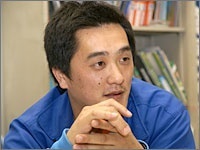 Mr. Suzuki said "What we feel at the workplace is that JV5 is the more stable. There is a defference between water-based ink and solvent ink, but the banding which affects the final image quality is almost eliminated. We are satisfied with the performance of JV5 in total." The production center make different use of the super wide-format inkjet printer and JV5 depending on the orders. For example, they use the super wide-format inkjet printer for the billbaord which is seen from a distance, and JV5 for the banner and sign board which are seen from the middle or short distance as those require higher image quality. However, the qualityof the image quality of banner and sign board is required for the billboard these days, and they said that how to respond to this demand is a big challenge. In January, 2007, a JV5 was installed in Chiba studio. They were busy getting prepared for "Tokyo Marathon 2007" in February 18th. They were dealing with thousands of traffic regulation or detour path signages, and other stuffs. The signs and graphics are printed by JV3 and JV4 which they were used to use. Then they made test print of JV5 for directional signs which designs are simple. "January was the most busiest period for preparing for the event. We had to use JV5 even we were not got used to use it. As a result, the directional signs are produce the most. Aside from the high image quality, we experienced how fast the print speed of JV5 is. As I was responsible for the project, I was relieved that we were able to deal with a huge number of orders." said Mr. Toga. The production amount of JV5 is 1600 square meter per month. JV5 is in its full operation all day and all night. "What is the most helpful is that unattended operation is possible. The Uninterrupted Ink Supply System, which automatically changes the ink cartridge when ink runs out. This allows for the continuous printing, so start printing at night, and the printing is done in the morning." said Mr. Suzuki. Now we are in the age that even bus, train, are the objects to be printed for advertising. The industry of signage is expanding year by year, and the client needs are getting complex and diversified. The current market requires the quick delivery with low cost without degrading the quality of the finishing. It is certain that the produciton department has the large responsibility for meeting the market demands in the future.